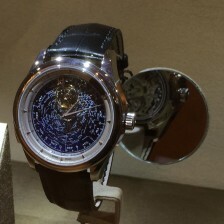 We’re suckers for Jaeger-LeCoultre, and the Memovox is one of their coolest models. Introduced in 1950 with the hand-winding Calibre 489, the Memovox was updated with an automatic movement and larger case option in 1956. Today, it is one of the best-loved classic Jaeger-LeCoultre models, and has been a source of inspiration for recent tribute models from the brand.